As a diabetic, I have extremely dry skin. If I allow it to, my skin peels and cracks because I just can’t seem to keep it hydrated enough. Over the years, I’ve learned to make homemade beauty products that help with it in ways commercial products just don’t. 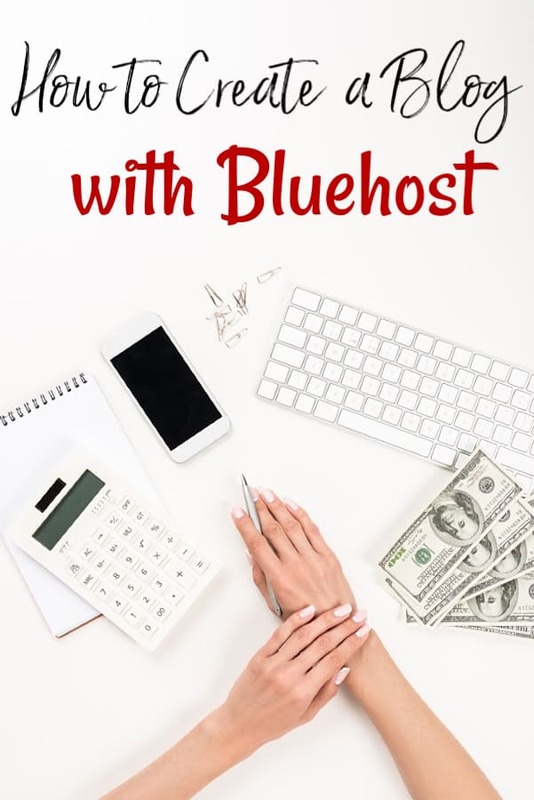 I started with my homemade lotion recipe and even though I still use it daily, sometimes – especially when I’m traveling – I want something more solid for easy travel. This homemade lotion bar recipe is the result of that need. There are a lot of benefits to using this homemade lotion bar recipe over my homemade lotion recipe aside from easy travel. The coconut oil and shea butter in these provide much needed moisture but do it in a way that doesn’t make a mess. 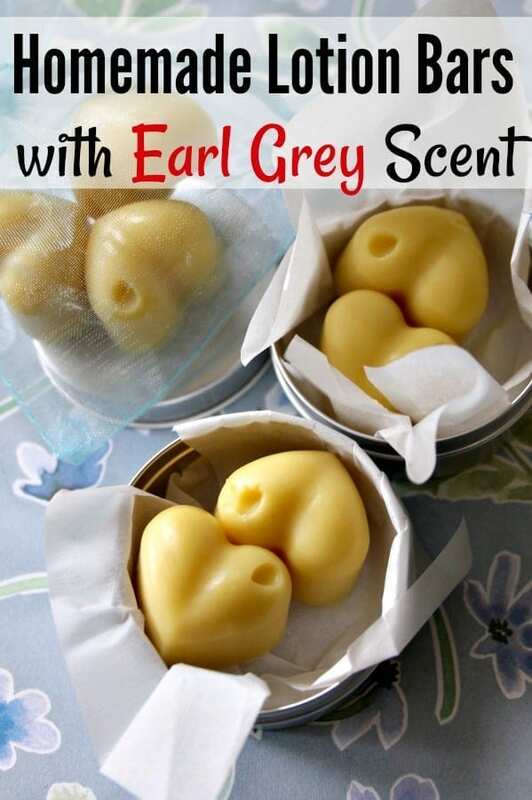 If you make the Earl Grey scented like I’ll give directions for in this post, the lavender essential oil and bergamot essential oils both nourish the skin while helping to calm issues such as skin that is too itchy because it’s dry. When you make this lotion bar recipe, you can actually customize it with any scent that you would like. Just keep in mind that different essential oils have different properties. For bars that help wake you up and give you a boost of good mood, you could substitute sweet orange essential oil. For bars that simply help calm before bed, use roman chamomile essential oil. If you want to give these as a DIY Christmas gift, use peppermint essential oil. The possibilities really are endless as far as which combinations of oil you can use. If you do want to make this lotion bar recipe, it goes fantastic in a DIY beauty gift basket alongside of my homemade deodorant recipe, my coconut shampoo recipe, my shea butter shave cream, and my green tea and peppermint bath soak! You could even make homemade bubble bath to add to it for a true spa gift basket. It doesn’t matter which brand of essential oils you use when you make this lotion bar recipe provided the oil you’re using are 100% pure essential oils. 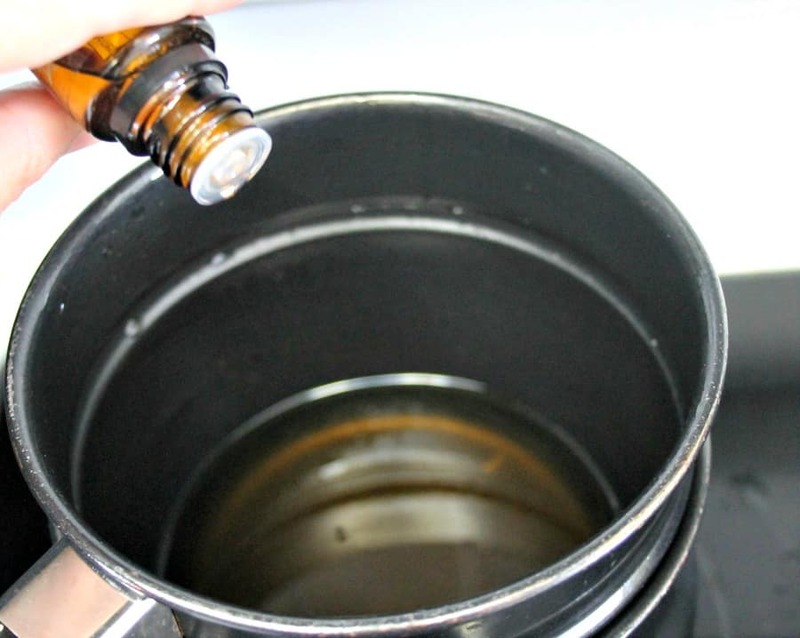 Oils that are not pure are generally cut with something like a carrier oil and not only can be dangerous, but can also cause your final product to turn out wonky or not at all. Contrary to popular belief, there is no federal grading systems for essential oils so you should not even rely on the term “therapeutic grade” for choosing oils. Literally anyone can bottle an oil and call it “therapeutic grade.” For my family, I buy Plant Therapy essential oils. They are pure oils without any cutting or fillers and are significantly cheaper than some of the other and larger brands. These directions for this homemade lotion bar recipe may seem complicated, but they’re really not. To begin, fill your double boiler around 2/3 full and place it on medium heat to heat it up. If you don’t have a double boiler, you can use 2 medium saucepans. Fill one 2/3 of the way full with water and place the other one on top of it. 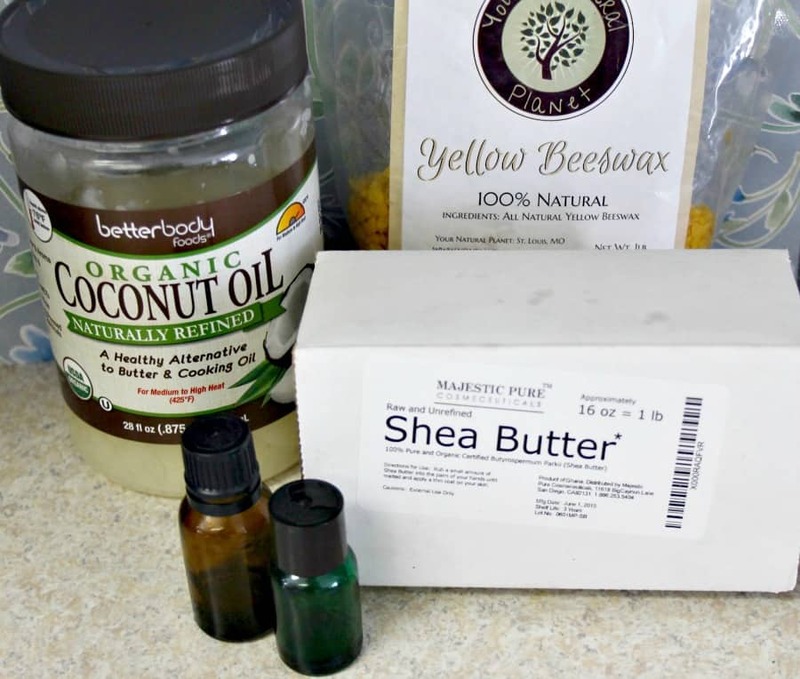 Just keep in mind that this lotion bar recipe uses beeswax and shea butter so don’t use anything you may have trouble getting clean. It isn’t hard to clean those ingredients off, but they can destroy a good pot if you aren’t careful. Next, measure out both your coconut oil and the shea butter. 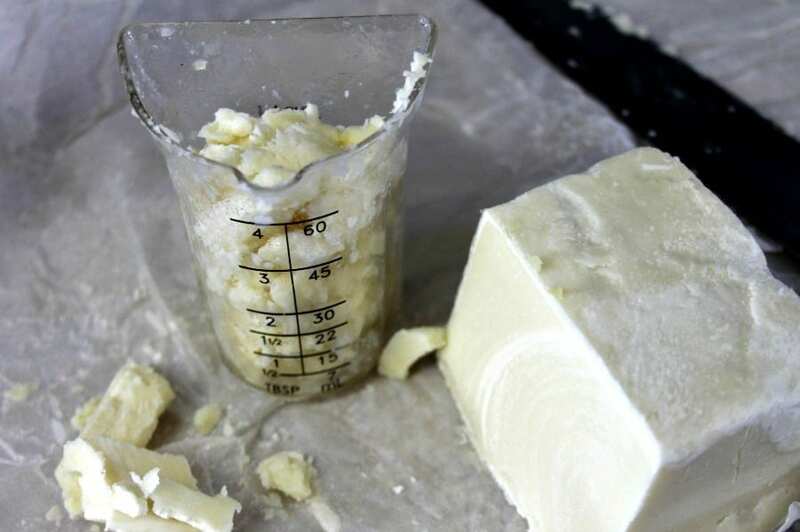 If you’re using a brick of shea butter, you’ll need to chip it off to measure. You can use a regular measuring cup, but I prefer THESE beaker style measuring cups for my DIY beauty products that contain beeswax. Measure out the beeswax at this time too. If you’re using a brick of beeswax, go ahead and chip it off and measure. Once your double boiler is boiling, turn the heat down to low and add the beeswax. You should take this time to make sure your silicone molds are set up and ready to be poured into. Allow the beeswax to melt slowly, stirring it often to help it melt and to keep it from burning. Be very careful as beeswax can burn easily. 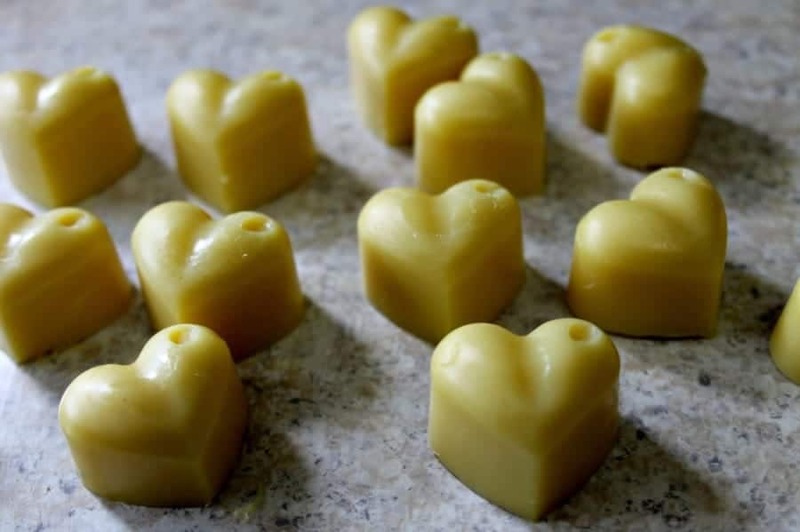 Once the beeswax is melted, add the coconut oil and shea butter and allow them to slowly melt as well. Stir in the shea butter first since it will take longer to melt and allow it to get going pretty well before you add the coconut oil. Once the shea butter and coconut oil are melted, remove the pan from the heat and allow it to cool for just a minute or so. Once it has, add the lavender essential oil and bergamot essential oils. The fragrance in this lotion bar recipe is extremely easy to play with. If you would like a stronger lavender scent, add more lavender. If you would like a different scent all togehter, change the essential oil you’re using. Make certain to give your mixture a good stir after you add your oils. After you’ve mixed in the oils, go ahead and pour your mixture into your molds. You can do this either by pouring the mixture into a spouted cup first and using that, by using a spoon to fill them or by using plastic pipettes like THESE to do so. I usually prefer to use pipettes. Make sure to leave a bit of room at the top of each mold spot to allow for any accidental overflow or spillage. Allow your filled molds to sit at room temperature until they are fully cooled and the lotion bars are hardened. You can check for temperature by feeling the bottom of the mold. If it is still warm, allow them to cool a bit longer. 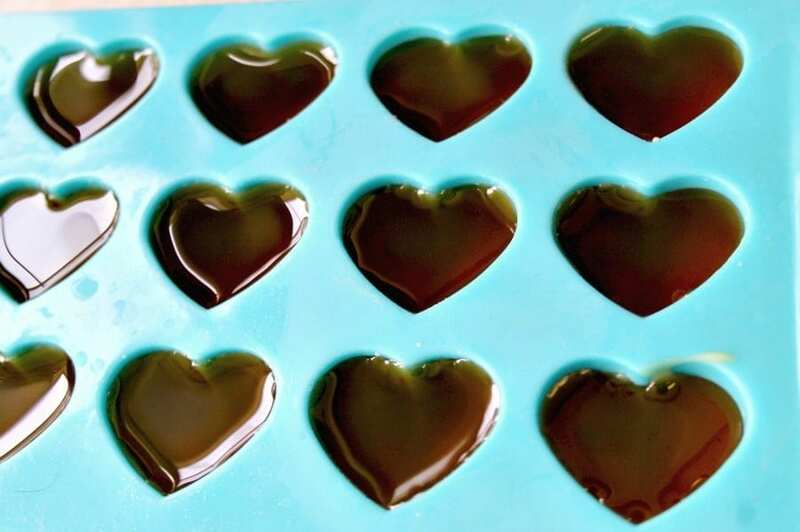 Once they’re fully cool, pop each lotion bar out of the mold. If you’re using the lotion bar recipe for yourself, pack them into an airtight jar making sure to use parchment paper to protect them from sticking to the sides of the jar. Store them at room temperature but keep in mind that they can and will melt if they get too warm. 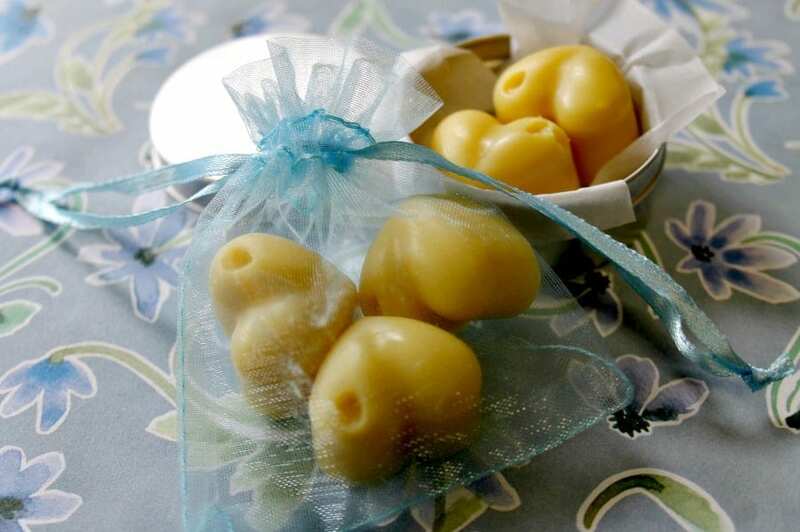 If you made my lotion bar recipe to use as a DIY gift idea, package them into a small metal tin lined with parchment paper or fill small organza bags with them for a pretty presentation.